The Baker's Reprise collection from Federal Donuts. 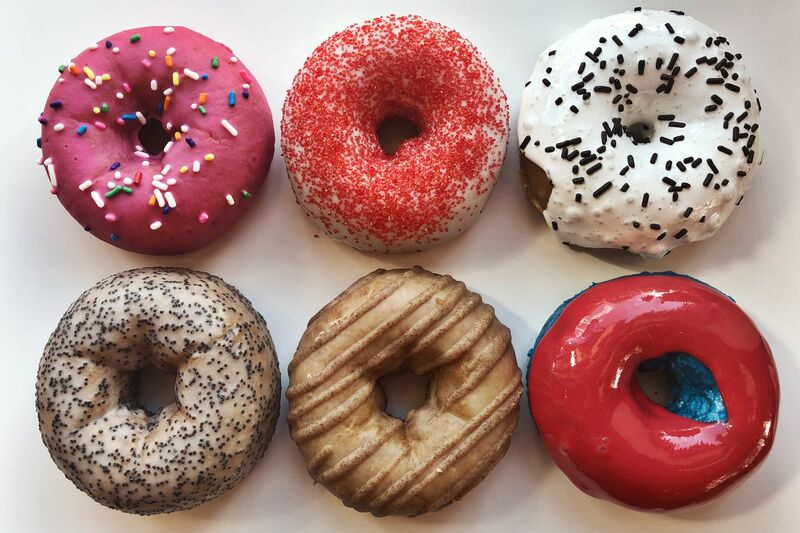 If Phish-themed doughnuts are your jam, Federal Donuts has good news: The company announced on Friday a new selection of baked treats, inspired by the band and released in celebration of Tuesday and Wednesday's upcoming shows at the BB&T Pavilion in Camden. It's the second such collaboration between the jam band and FedNuts, which last year was brought on board to produce doughnuts for concertgoers at each night of Phish's 13-night "Baker's Dozen" residency at New York's Madison Square Garden. This year's tribute, the Baker's Reprise, includes six special flavors: glazed, red velvet, lemon poppy and maple, as well as "Fluffhead," which is topped with marshmallow fluff, and "Fishman," a blue donut with red icing. Boxes of 12 contain two of each flavor and are available for pre-order online starting today. A “Fishman” doughnut from Federal Donuts. The partnership with Phish was sparked last summer when the band contacted FedNuts' Felicia D'Ambrosio, a longtime superfan, with a request to make doughnuts for guests at the Baker's Dozen shows. D'Ambrosio and FedNuts chef Matt Fein ended up supplying thousands of the pastries for Phish fans who attended the concerts, which ran from July 21 through August 6. Boxes of the Baker's Reprise will be ready for pickup and available in stores for walk-ups on Monday, Tuesday and Wednesday. The doughnuts will be sold at all Federal Donuts locations: 1632 Sansom Street, 1219 S. 2nd Street, 3428 Sansom Street and 701 N. 7th Street. For more information, go to cooknsolo-store.myshopify.com/products/phish-the-bakers-reprise.